In the spirit of the holiday season (and as a result of our recent education at BYOB), we’re mixing up some cocktails to service at our upcoming holiday fiestas. Will you be hosting a few of your girlfriends or close family members this winter? Here are three recipes that are so simple, but are sure to wow and refresh your mom, dad AND your besties. 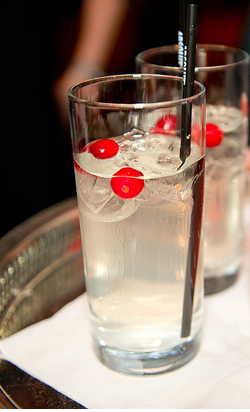 Mix one ounce of ABSOLUT Vodka with white cranberry juice, top with fresh lemonade to taste and garnish with cranberries and a black straw. The amount of white cranberry juice and lemonade added will depend on your glass size, and how strongly you like to mix your drinks. The simple, not-too-sweet flavour of this cocktail makes it perfect for a family holiday party. Great to prepare a half hour in advance and hand guests a drink as they come in the door. Classy and festive. Mix one ounce of ABSOLUT vodka with sparkling pink grapefruit juice (of your choice) and garnish with a sprig of fresh thyme and fresh raspberries. The combination of the grapefruit with thyme will keep your taste buds guessing, while the fresh raspberries offer a pinch of sweetness. This is a crowd pleaser, especially if you are hosting a girl’s night. 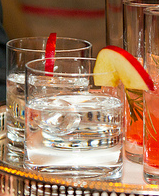 Mix one ounce of ABSOLUT vodka and soda and garnish with a red apple slice. You can also infuse the apple slices in the soda for about a half hour and let them float in the cocktail. This one goes out to the boys in our life. Served in a short glass, this cocktail reminds us of something Don Draper might sip on at a holiday party. Yummy x2.